Human rights activists are raising concerns about the United Arab Emirates' new claims of ground-breaking religious tolerance while its legal system —with its reliance on Sharia law—has forced a Christian American family into a five-year, tortuous court fight to recover its rightful inheritance. 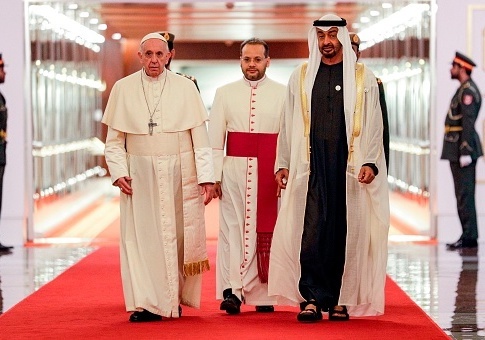 The papal visit was a breakthrough for religious tolerance in the heart of the Muslim world, with its gathering of 120,000 Christians in Zayed Sports Stadium and his dialogue with UAE leaders, including the crown prince and the local Muslim Council of Elders. The UAE used the occasion to declare 2019 "the year of tolerance" and announced a "festival of tolerance," as well as a new cabinet post for a minister of tolerance. However, those keeping tabs on government restrictions on religion and biases in the judicial systems across the Arabian Peninsula and Middle East are warning businesses, other would-be investors, and travelers to the UAE that severe cases of discrimination continue to persist there. Moreover, they are actually government-ordered in Saudi Arabia, the UAE's neighbor and closest ally. A Virginia family's legal saga began when Franz Zenz, who has worked in Dubai since shortly after the Sept. 11th attacks and owned roughly $5 million in property there, died in his family home in McLean, Va., in 2014 after suffering from bone cancer. His wife of 41 years, Nicole, and his two daughters have spent the last five years trying to handle his estate and recover their inheritance. When his family tried to assume ownership of several of their Zenz's properties in Dubai, they needed to go through the country's courts, which are riddled with biases against Christians and other religious minorities, as well as foreign citizens. The United Nations Special Rapporteur on the Independence of Judges and Lawyers in 2015 expressed concern that the judicial system remains "under the de facto control of the executive branch of government" and found that the courts often apply laws in an arbitrary manner. "The special rapporteur is concerned about reported instances in which judges appear to have lacked impartiality and shown bias, especially with regard to non-nationals of the United Arab Emirates," the 2015 report said. The Zenz family—Nicole, daughters Kimberly and Courtney, and Franz Zenz's sister, Regina—knew they were wading into unchartered waters when they sought to enforce Franz's will in UAE courts. They had no idea, however, that they would face a fierce inheritance challenge from a Saudi woman living in the UAE, Meshaal Khalaf Mohammed al-Amri, who claimed in court filings that she had married Franz Zenz. A visa application for Zenz that al-Amri filled out also clearly undermined her claims. The Zenz family provided the court the visa application, which listed Zenz as a "non-Muslim." They also noted that al-Amri had filled out the application one year after she claims he had converted to Islam, court documents show. Al-Amri did not dispute the Zenz's points. When lawyers started looking into al-Amri's background, she quickly lost credibility. The Dubai trial court ruled in the Zenz family's favor after explaining in its written opinion that al-Amri's marriage to Zenz was "unproven" because she relied on falsified records, and her witnesses had contradicted each other and were deemed not credible. Saudi law requires strict documentation to prove marriage, a threshold al-Amri's forged records fell far short of meeting. The ordeal continued when al-Amri appealed. The Dubai appeals courts sat on the case for two years. Then, unlike most trusted court systems, which do not allow new witnesses in cases that are appealed, the appeals court permitted al-Amri to bring in her brother to testify but barred the Zenz family from countering these witnesses. Sharia courts also accord less weight to testimony of non-Muslims than testimony by Muslims. The appeals court ruled in al-Amri's favor without addressing the facts in the prior trial court opinion. On March 19th, the UAE's highest court, its Court of Cassation, reportedly will render its final determination. When Nicole, Franz Zenz's 71-year-old widow, traveled to the UAE to be present for the court proceedings three months ago, her passport was immediately confiscated. Earlier this month, during a conference call with reporters on the pope's historic UAE visit, Brownback declined to comment on the Zenz matter, although he acknowledged that he is aware of it. Nina Shea, an international human rights lawyer who directs the Hudson Institute's Center for Religious Freedom, said the Zenz's ordeal should raise a "big red flag" for businesses and other investors in the UAE. "In the UAE, Christians and other non-Muslims could be declared secret Muslims in an unsubstantiated ‘Me Too' scenario in the country's Sharia courts with grave financial and other consequences to them and their heirs," she said. "This is an outrageous act of disrespect for Mr. Zenz's Christian identity and a terrible injustice to his family," she added. "It appears that the UAE legal system is stacked against Christians, Jews, Hindus, and others." Russell Moore, president of the Ethics & Religious Liberty Commission of the Southern Baptist Convention, has called on Pope Francis to intervene on the Zenz family's behalf. "The court's decision will speak volumes about the discrimination that religious minorities face daily in the Gulf States, and about the religious double stands the [UAE's] legal system enforces to ensure that money Christians earn in Dubai stays in Dubai," Moore wrote in an article in National Review. "One does not need to be a Christian to see that depriving a man's daughters and his wife of 41 years their rightful inheritance because they are not Muslims is not just under any standard," he concluded. This entry was posted in Issues and tagged Pope Francis, Saudi Arabia. Bookmark the permalink.